There was a time when games weren't there to train your brain, or slimline your body whilst tricking you you are having fun. Are all these new fangled gadgets making you wish you could bring the simple joy of your Spectrum ZX or Commodore 64? Well, stop your eBay searching and put away your soldering irons - a cheap and cheerful solution is within your reach. 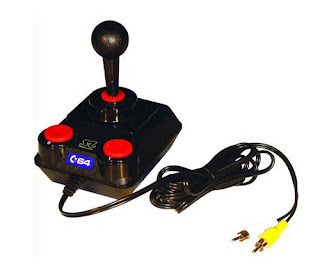 GameSeek.co.uk currently have Commodore 64 DTV Plug n Play joysticks on sale for a bargainous £16.97 so you can re-live the magic of your favourite C64 games directly on to your TV. The joysticks feature 30 full colour games including Winter Games, Jumpman Junior, Alleycat, California Games and Speedball. You don't have to wait a lifetime for tapes to load, however, as they load almost instantly. The games are exact copies of the original with the same sound, music and graphics. Ditch those spanking brand new Wiis and shove your PSP in your sock draw, this is where the fun begins. Check out the nifty joysticks here. They have one of these that is Atri specific too. In fact it has the Atri controllers and everything, just the games built in. This one looks great, it has some other games that were state of the art for the time :-). Win The Herbs and Parsley!